Whether it’s a mixture of childhood birthday nostalgia and portion control or something else — like “fun” — the world is feeling cupcake love nowadays. That includes Boulder cookbook author Elana Amsterdam, who devoted a month to cupcakes on her blog, elanaspantry.com. The kicker: Amsterdam specializes in gluten-free foods, publishing her first cookbook, “The Gluten-Free Almond Flour Cookbook,” in 2009. When Amsterdam’s editor saw the cupcakes, she suggested a follow-up cookbook. The first book introduced readers to Amsterdam’s philosophy of gluten-free cooking, which is to make baked goods that taste good to everyone and to emphasize healthful ingredients. The latter are often sadly missing from gluten-free recipes. While such flours are a huge improvement for people with celiac disease or gluten sensitivity, they are not healthful ingredients in and of themselves, since they have less protein and fiber than wheat flour and are higher on the glycemic index. In addition, Amsterdam uses agave nectar instead of sugar in her recipes. In her first cookbook, she used blanched almond flour, which is high in protein. In the new book, she adds coconut flour to her repertoire. Don’t just take Amsterdam’s word for it. Her neighbor and her neighbor’s children ended up being informal testers for many of the recipes in the book. Besser, who does not have a problem with gluten, says the cupcakes are delicious even when compared with traditional cupcakes. “Across the board, I think her recipes can stand up to a wheat-based cupcakes,” Besser says, adding that she’s not going to waste calories eating something that’s not good. The cupcakes are also dairy free, since many people who can’t tolerate gluten also have problems with milk and butter. Some recipes are also vegan. Amsterdam says this cookbook was in some ways more challenging than her previous almond-flour book. experimentation, since it absorbs liquids much more readily than other flours do. In addition, making frostings without butter or sugar was something of a feat. Along the way, Amsterdam learned how to use some ingredients in different ways. The cream that sits atop a can of coconut milk, for example, can be whipped to make a vegan frosting. 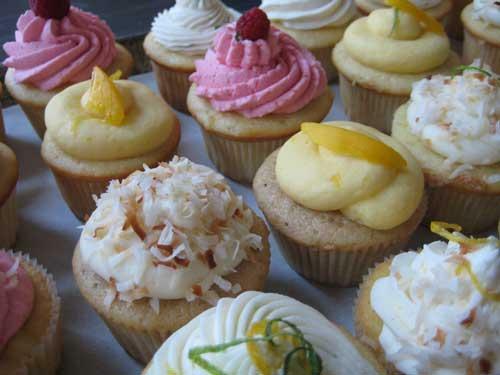 In addition to the sweet cupcakes, which include German chocolate cupcakes, red velvet cupcakes and white chocolate cherry cupcakes, among many others, Amsterdam has included several savory cupcakes such as scallion goat cheese muffins and spinach feta muffins. Amsterdam says she also strived to make the cupcakes simple to make. And then there’s the fact that the book is all about cupcakes. Directions: Preheat the oven to 350. Line 8 muffin cups with paper liners. Directions: In a small saucepan over medium heat, bring the agave nectar to a boil, stirring constantly. Decrease the heat to low and simmer for 6 to 10 minutes, watching constantly and stirring occasionally, until the agave nectar darkens slightly from its original amber color, then remove from the heat and set aside. In a deep bowl, whip the egg whites to stiff peaks using a handheld mixer. Be sure to push the beaters around the bowl to incorporate air into the whites. This step is important; if your egg whites are not whipped to stiff peaks, the recipe won’t work. Stop whipping as soon as the egg whites are stiff; overwhipping will result in egg whites that are dry and grainy. The foam of the whites will be stiff enough to stand up in well-defined, unwavering peaks. Drizzle the warm agave nectar very slowly into the egg whites, while whipping with a handheld mixer, to keep the peaks stiff. The meringue will become pearlescent and shiny. Allow to cool to room temperature, then fold the strawberries into the meringue. Use right away. Directions: In a medium saucepan over very low heat, melt the chocolate until smooth. Allow the pan to stand on the counter for 5 to 10 minutes to cool the chocolate to room temperature. Blend the chocolate into the shortening with a handheld mixer, then blend in the agave nectar, vanilla extract, water, and salt until smooth. Place the saucepan in the refrigerator for 3 to 8 minutes, until the frosting becomes spreadable. Directions: Preheat the oven to 350. Line 10 muffin cups with paper liners. In a large bowl, combine the almond flour, salt, baking soda, and black pepper. In a medium bowl, whisk together the olive oil and eggs. Blend the wet ingredients into the almond flour mixture with a handheld mixer until thoroughly combined, then stir in the scallions. Scoop 3 tablespoons of batter into each prepared muffin cup, then press 1 tablespoon of goat cheese into each muffin. Bake for 20 to 25 minutes, until a toothpick inserted 1/2 inch from the edge of the muffin (to avoid the goat cheese center) comes out with just a few moist crumbs attached. Let the muffins cool in the pan for 20 minutes, then serve. This entry was posted in About Cupcakes, cooking, Cupcake Recipes, Cupcakes, Cupcakes in the News, dessert, Food, Gourmet, Kosher, Recipe, red velvet cupcakes and tagged Baking, Cooking, Cupcake, Food, gift. Bookmark the permalink.